Mrs. Becker taught French at Sunny Hills in the 1960s. Mrs. Becker was married to Dr. Ernest Becker, a founding Dean of Students at Cal State Fullerton, a professor of philosophy, former newspaper reporter, ordained United Church of Christ minister and former counselor at Pasadena City College. For a while the couple lived in India. In 1959 they came to Fullerton and Dr. Becker helped found the university. He died in February 1983. 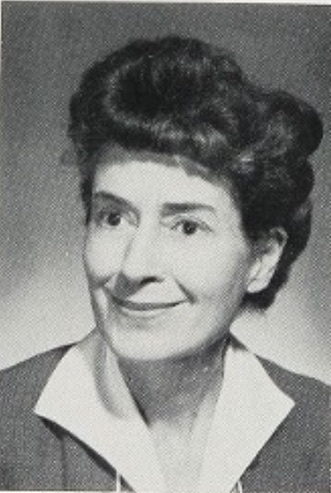 Mrs. Becker was the secretary to American theologian Reinhold Niebuhr (1892-1971) at Amherst College (Amherst, Massachusetts) when her husband interned there. Later when Dr. Becker worked at Cal State Fullerton, he and Mrs. Becker often took their lunches at home near the college campus. In July 1976, their oldest son Stephen died in a shooting at Cal State Fullerton. They have one other son. Mrs. Becker was an elegant lady and played an important role in the founding and early years of Sunny Hills High School. She died in 1990. Thank you for providing this biography. I couldn't say it better than Stephanie did. Mrs. Becker was a lovely woman and I wish I had known more about her when we were students in her classes. I remember Mrs. Becker with such fondness. She represented European elegance in a modest and soft-spoken person. She was a stickler for pronounciation and grammar, but the overriding gentility of her teaching is what I recall, and her soft smile. Mrs. Becker exposed us to some French poetry that was so moving; who knew that was what language was for? As such, a foreign language became more than vocabulary for me. I remember the way she wore gold and silver jewelry together with such elan; she wore simple and classic silhouettes, an Audrey Hepburn for the teaching set. What a role model for an awkward teenage girl trying to find her way. Years later, and after the death of one of her sons, I wrote to her, and received a lovely note in reply. I still have the note, though I need nothing to remember this lovely woman.